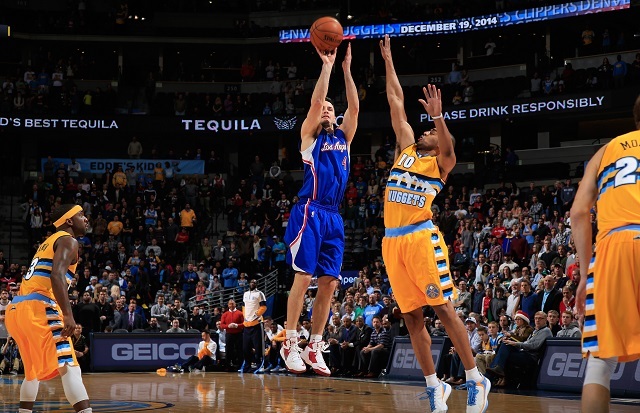 As specialists, pure shooters can always fill a role in the NBA. At any point in time, a shooter can catch fire, fill it up, and swing the entire momentum of the ballgame. Away from the ball, a reputable shooter can serve as an effective decoy to spread the floor, for both athletic wings and big men to go to work in the paint. The five best five shooters in the game right now are all notable for textbook shooting form and accuracy, in conjunction with consistent scoring and a keen sense of the moment, often coming up big in the clutch. 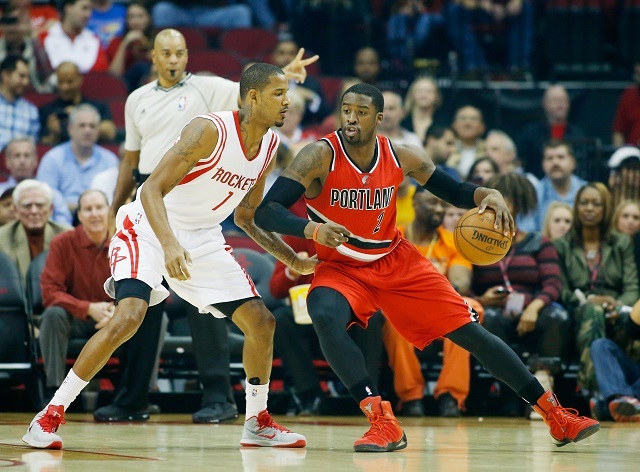 Wesley Matthews, like all NBA players based out of Portland, is underrated and nearly unrecognized by casual fans. The historical lack of exposure has largely been due to the fact that the sun has already set upon major media markets by game time in the Pacific Northwest, as well as the Trail Blazers’ general aversion to the postseason. In any event, Matthews has quietly emerged as one of the best shooters in the NBA right now. For his career, he has averaged 14 points per game, on 39% three-point and 83% free throw shooting. Over the regular season Matthews was dropping in 16 points per contest. Perhaps most impressively, is the fact that Matthews was knocking down 57% of his two-point field goals. Interestingly, Matthews takes the majority of his shots from either drives to the front of the rim, or from behind the three-point arc. He’s particularly deadly from the left side of the arc, where knocking down more than 45% of his attempts, according to his 2014-2015 shot chart. Unfortunately, a torn Achilles’ Tendon spelled the end of the season for Worldwide Wes, and his scoring was sorely missed by the Blazers, who were bounced from the playoffs in short order. J.J. Redick’s reputation as a nationally renowned sharpshooter began in 2002, as a Duke University freshman. As a precocious Duke freshman, Redick averaged 15 points per game, on respective 42% and 91% shooting from behind the three-point line and the charity stripe. In all, J.J. Redick was to finish his four-year career at Duke as the storied program’s all-time leading scorer, with 2,769 career points. As a sign of things to come, Redick also closed out his collegiate career as the ACC’s all-time three-point shooter after making 457 three-point field goals. Now nine seasons into his NBA career, Redick has made nearly 900 shots from deep, shooting the three with 40% accuracy overall. At the charity stripe, he is also nearly automatic, with an 89% career free throw shooting average. In half-court sets, Redick is most comfortable running the baseline and curling off screens for deep corner three pointers. In transition, he often leaks out and sets up shop behind the arc — the unsung hero of Lob City. Because of his unlimited range, Redick effectively clears space for point guard Chris Paul to run the pick and roll with Blake Griffin and DeAndre Jordan. In four short years, Klay Thompson has evolved into complete guard from the bench-ready instant offense for which he was drafted. 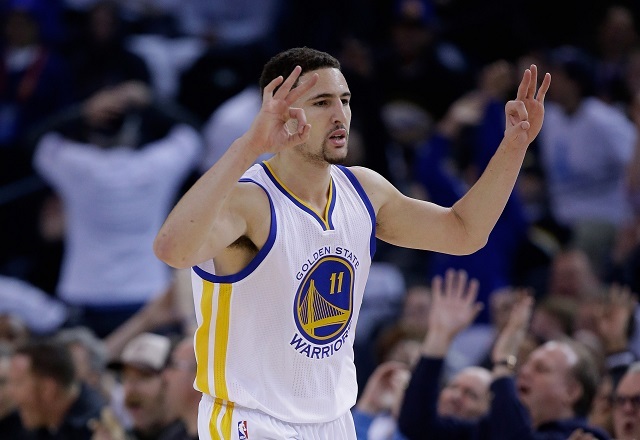 As a rookie in 2011-2012, Thompson averaged 12.5 points per game off 41% three-point shooting. That year, Thompson only attempted 1.4 free throws per game, as he solely filled the jumpshooter role for Golden State. Prior to this season, however, the younger Splash Brother signed a four-year, $70 million contract — the kind of money that you give to a player who’s significantly more diverse. So far, Thompson has made good on his end of the deal, as he averaged 21.7 points per game off 44% three-point shooting. Aggressive defenders who crowd Thompson to take away his jumpshot are repeatedly torched on up-fakes and explosive drives to the rim. This season, he’s averaging 3.7 free throw shots per contest as further evidence of the ongoing evolution in his game. Sure, he’s hit a bit of a brick wall in the series against Memphis, but Tony Allen and company do that to everyone. As a shooter, reigning MVP Stephen Curry is as serious an offensive force as anyone in the league, with his array of floaters, fade-away shots, turnaround jumpers, and open three-point attempts. Curry has proven equally as dangerous coming off screens as he is operating at the top of the key in isolation one-four sets. In all, Curry averaged 23.8 points per game off 91% free throw and 44% three-point shooting this season. Prior to this season, he led the NBA in three-point fields goals made in back-to-back 2012-2013 (272 for NBA single-season record) and 2013-2014 (261) seasons. 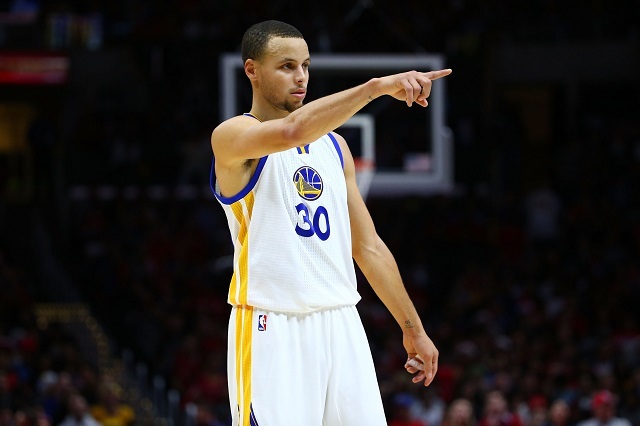 For his six-year career, Curry has already made 1021 triples. For the sake of comparison, all-time leader Ray Allen rattled in 2,973 three-point shots after 18 years of service in the NBA. As a shooter, Curry has mastered the art of the step-back jumper, which he puts to use both in transition and off the pick-and-roll. Prior to the step back, he will fake a hard drive to the hoop to get his man off balance. From there, Curry will lean into a jab step, before crossing the ball over, and stepping back behind the three-point arc. With a quick release, the ball is already over the outstretched hands of the defense and into the bottom of the net. Kyle Korver has carved out a niche for himself as a pure shooter after being drafted into the League as a 51st overall pick out of Creighton in 2003. For his part, Korver has already parlayed his specialization for marksmanship into a 12-year career, USA Basketball membership, $24 million contract, and comparisons to Ashton Kutcher. 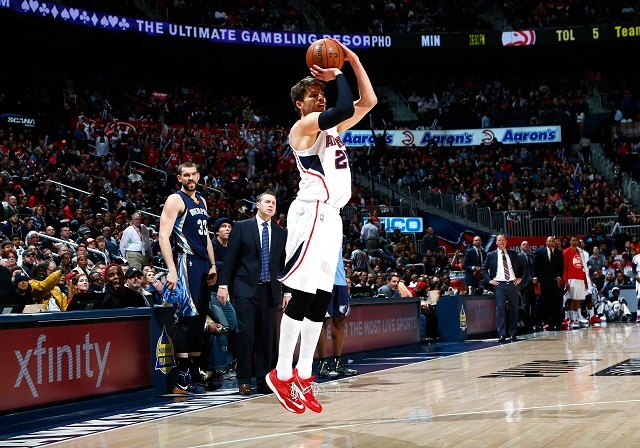 Throughout his career, a three-point shot from Korver was a better bet than a two-point attempt from the majority of NBA players. This season, Korver shot 49% from behind the three-point line, and at one point he was in contention to tie the all-time NBA three-point accuracy mark. Who holds that record? He does — Korver set it back in the 2009-2010 season.